Summary Newspaper clipping, unnamed and undated (most likely the Saturday Express and sometime in 1993). Marlborough Riflemen who have Represented New Zealand overseas, by Mick Jellyman. There is a black and white picture from a photograph taken by Gordon McCusker, Blenheim before 1961 (see notes). Back Row: A.F. Paynter (1950 Australia), A.J. Henderson (1911 Bisley). In Front: C.A. Hadfield (1907 Australia, 1909 Australia), W.N. Masefield (1907 Australia, 1909 Australia, 1910 Bisley, 1920 Australia, 1929 Bisley, 1929 Victoria, 1938 Australia, 1950 Australia), W.H. West (1920 Australia, 1920 Bisley, 1938 Australia). This photograph and the information were supplied by Terry Looms, himself no mean performer on the range. Bill Masefield early in World War 2 was an officer in the Nelson-Marlborough Mounted rifles and used his knowledge with the rifle to show the recruits some of the finer points. C.A. (Charlie) Hadfield - New Zealand team to Australia 1907 and 1909. A member of the Blenheim Club until the early 1920s when he joined Kaituna. President of the Kaituna Club for 26 years. W.N. (Bill) Masefield - New Zealand team to Australia in 1907, 1909, 1920, 1929, 1938, 1950. To Bisley 1910 and 1929. Won the Ballinger Belt in 1914, 1929, 1936, 1939 and 1948. He was the only rifleman to win the belt five times up to 1993. From 1925 to 1939 his worst placing at Trentham was 15th. He was a member of the Sounds club until about 1920 when he joined the Blenheim Club. A.J. (Arthur) Henderson - New Zealand team to Bisley 1911. In 1911 runner-up for the Ballinger Belt losing by one point. His score of 45 out of 50 in the final at 1000 yards won him the Rifle Challenge Cup for the highest score in the final 50. He won this Cup again in 1920 for the second time a feat very few riflemen have achieved. A member of the Sounds club until about 1923 then the Linkwater Club. W.H. (Wally) West - New Zealand team to Australia 1920 and 1938. To Bisley 1920. In New Zealand versus Great Britain and South Africa 1938. Runner-up for the Ballinger Belt at least twice 1919 and 1920. Won the Rifle Challenge Cup 1919. Was well placed in Ballinger Belt series regularly for many years. Member of Renwick, Kaituna and Blenheim clubs. A.F. 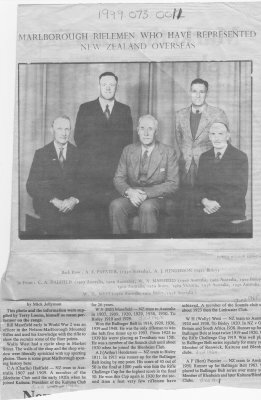 (Bert) Paynter - New Zealand team to Australia 1950. Runner-up for Ballinger Belt 1963. Well placed in Ballinger Belt series over many years. Member of Blenheim and later Kaituna/Blenheim Clubs.